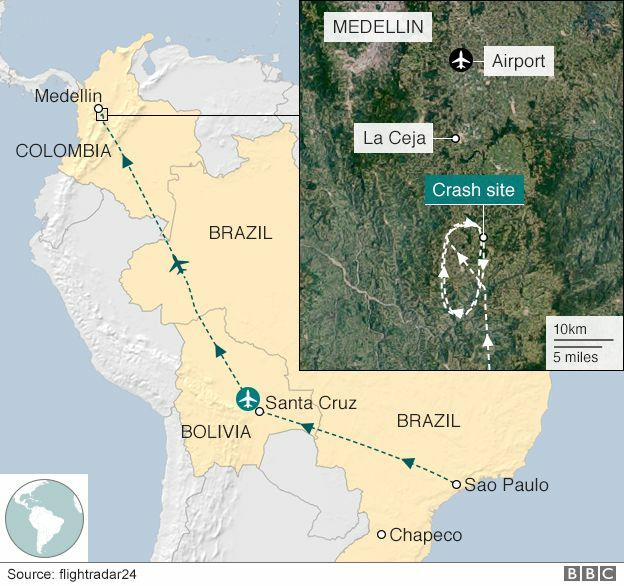 The site of the plane crash on the outskirts of Medellín, Colombia, on Tuesday. Reports say seven people were pulled alive from the plane but two have since died including the team's goalkeeper. The first leg of the final of the cup, South America's second most important club competition, was scheduled for Wednesday but has now been suspended. The match was seen as the biggest in the history of the relatively small club, which entered Brazil's top division for the first time in 2014. Brazilian President Michel Temer announced three days of national mourning, and top Spanish clubs Real Madrid and Barcelona held a minute's silence at the beginning of their practise sessions. The South American Football Confederation (Conmebol) said it was suspending "all activities". Chapecoense issued a brief statement saying: "May God be with our athletes, officials, journalists and other guests travelling with our delegation." Later the team's vice-president, Ivan Tozzo, told cable channal SporTV: "There are a lot of people crying in our city. We could never imagine this. Chapecoense is the biggest reason for joy here." Some reports suggest another defender, Heilio Neto, was also rescued. The club's main goalkeeper, Marcos Padilha aka Danilo, was also pulled alive from the wreckage but a spokesman said he later died in hospital. The sports network Telemundo Deportes tweeted (in Spanish) that Ruschel was in shock but conscious and talking, and asked to keep his wedding ring and to see his family. His wife told Globo TV: "Thank God Alan is in the hospital. He's in a stable condition." The team, from the southern city of Chapeco, was promoted to Brazil's first division in 2014 and reached the final last week after a victory against Argentina's San Lorenzo. Medellin's Mayor Federico Gutierrez described it as "a tragedy of huge proportions". Conmebol said in a statement that its president, Alejandro Dominguez, was on his way to Medellin. "The Conmebol family greatly regrets what happened. All activities of the confederation are suspended until further notice," it said. She may have reportedly had "production issues" earlier but pop sensation Jennifer Lopez has confirmed her participation in the opening ceremony of the FIFA World Cup 2014. Organisers say it will be a gala and glitzy affair. There are no more people officially missing after mudslides in Colombia killed at least 254, the country's president said Sunday. Brazil rode a wave of national fervour to launch the World Cup with a 3-1 victory over Croatia on Friday as an opening day which began with violent clashes gave way to an outpouring of joy. The Final Match of the 2014 FIFA World Cup Brazil™ will be preceded by a spectacular musical show, with the superstar line-up of artists for the Closing Ceremony now announced. Four continents, 16 cities, 192 "lost" wallets. That's the basic formula for a recent sticky fingers experiment by Reader's Digest.